Neal and I love to visit our Morgan in Auburn and take her out to eat as a treat for all of us. I kept searching for someplace wonderful and finally found out about Acre. Acre—what an unusual name for a restaurant. I just knew there was a great story behind this place. I called and made reservations and was hoping for a delightful experience. Not only was I delighted with this glorious restaurant, but Neal and I loved spending time with the proprietor, David Bancroft. He came to our table, introduced himself, and told us his story. 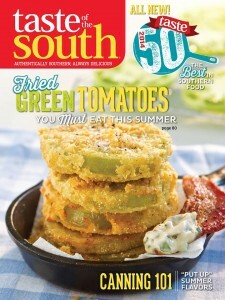 When he finished, I told him I published magazines and would love to feature his restaurant in Taste of the South. The current issue, July-August 2014, features his story. I wanted to share my thoughts about David and his genius idea with you. Entrepreneurs are near and dear to my heart. Nestled in the heart of downtown Auburn, Alabama (home of the Auburn Tigers), is the new restaurant Acre. 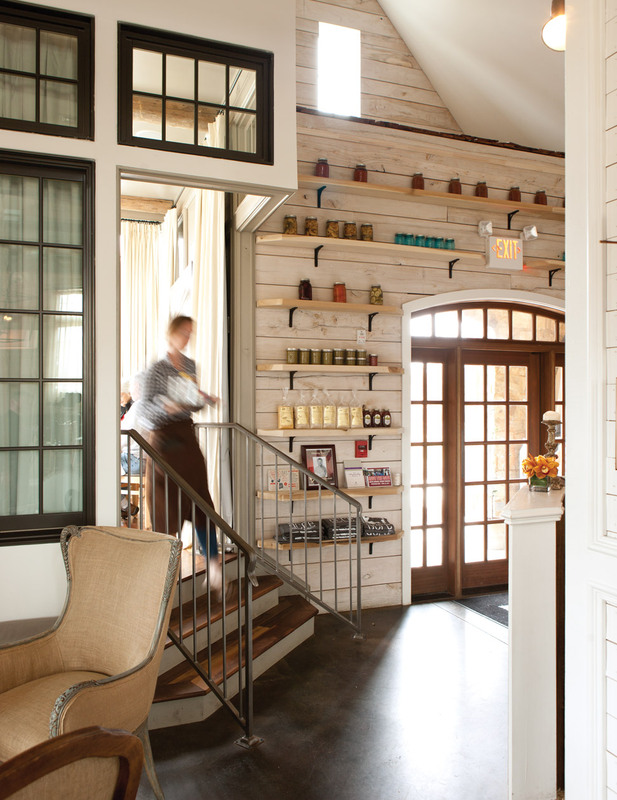 David’s restaurant sits on one acre, and celebrates the beauty of serving everything local. He purchases fresh foods from local growers and even grows much of his own crops on the acre surrounding the restaurant. David’s menu is ever-changing with the harvest of foods that he sources. I love the fact that he buys from local farmers. Nothing is premade at Acre but prepared fresh in the kitchen—and foodies have taken notice! His love of food goes back to his childhood when he cooked for himself rather than purchasing fast foods. He recounts that he worked in a restaurant part-time while he was a student at Auburn, and like so many restaurants, much of the food was purchased already prepared. 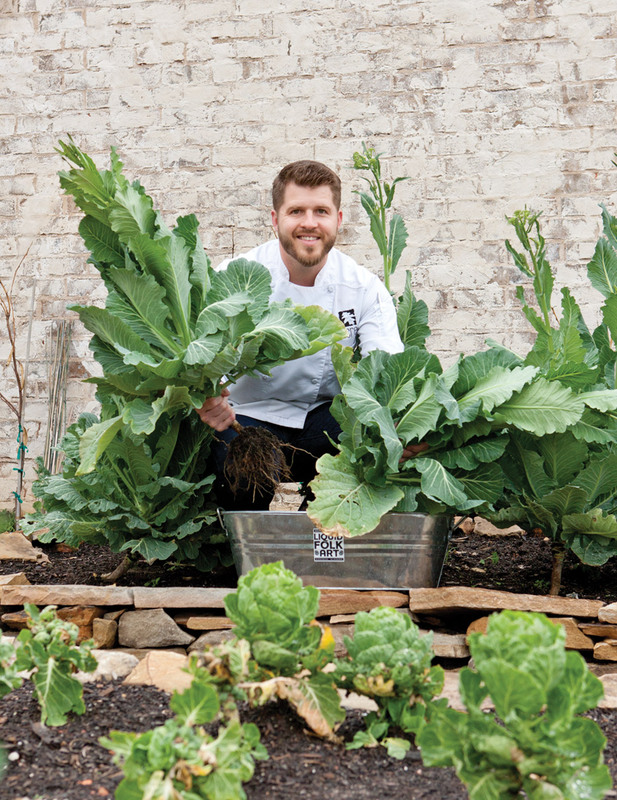 His concept of fresh foods from local growers, in addition to his own passion for gardening, lead him to his own restaurant concept—Acre. I had an opportunity to ask David some questions now that his restaurant has been open almost a year. Tell me about your vision for Acre when you began. I’ve always enjoyed the communal qualities of food and social gatherings designed around food. Memories of gathering around my Mama Jean’s long farm table will always remind me of the warmth and value of family tradition. Our goal when my family and I were visualizing Acre was to recreate the same values of Southern heritage through the décor using repurposed and salvaged materials that were important storytelling devices of our family history. Through our menus I wanted to tell the other half of the story through my interpretation of where Southern cuisine is headed. 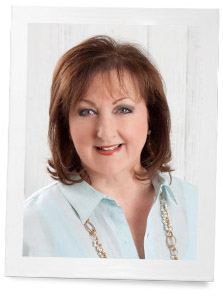 Has your vision come true a year down the road from your beginning? We are not quite a year old, but our birthday celebration “Harvest Party” will be an annual festival honoring the previous year’s efforts. I feel that we are, however, slowly hitting a groove. We have plenty of areas (and always will) that require attention. Our team strives to offer better customer service and improve our quality daily! What are your challenges in keeping your restaurant fresh? Our menus are definitely subject to the rhythms of the season and controlled by local harvests. We rewrite our menus daily trying to rotate through the freshest ingredients grown on our acre or provided by local farms. We also rely on these same values of ‘fresh’ and ‘local’ at our bar to ensure our drinks are creative, vibrant, and current. We are currently under our first renovation at the 10-month mark. Instead of adding more seats to gain more revenue, we are adding a butchering facility so that we can properly butcher locally raised animals and provide a more respected product to our customers. Fast forward a few months. We returned again for a delightful evening, and David brought out his versions of Fried Green Tomatoes. Oh My GOSH. I could not believe this amazing creation. 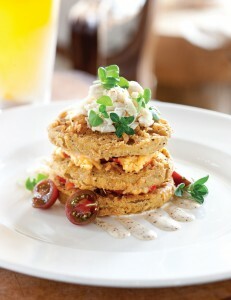 Fried green tomatoes layered with pimiento cheese and topped with crab—does it get any better? He has graciously shared this recipe with us. What a treat. Get his Fried Green Tomato recipe here. 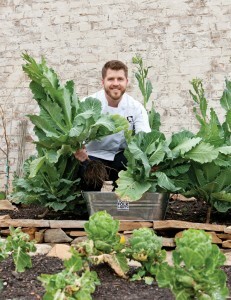 His restaurant is on track to be one of the South’s top places to eat. In fact, I think it already has arrived. People come from all over the South to dine at Acre and experience this amazing place. Bo Jackson and his wife came in as we were leaving and asked for their usual booth. What a compliment! Congratulations David on basing your business on locally grown food. You are the best. See you when school starts back! Have you tried Acre restaurant? What did you think? There is nothing about this restaurant that my girlfriend and I don’t like! Too bad they’re not open on Sundays. Thank you for sharing your dining experience with us. Also, I enjoyed the interview. We have a wonderful restaurant in our area called, The Chef and the Farmer located in Kinston, NC. It is divine! 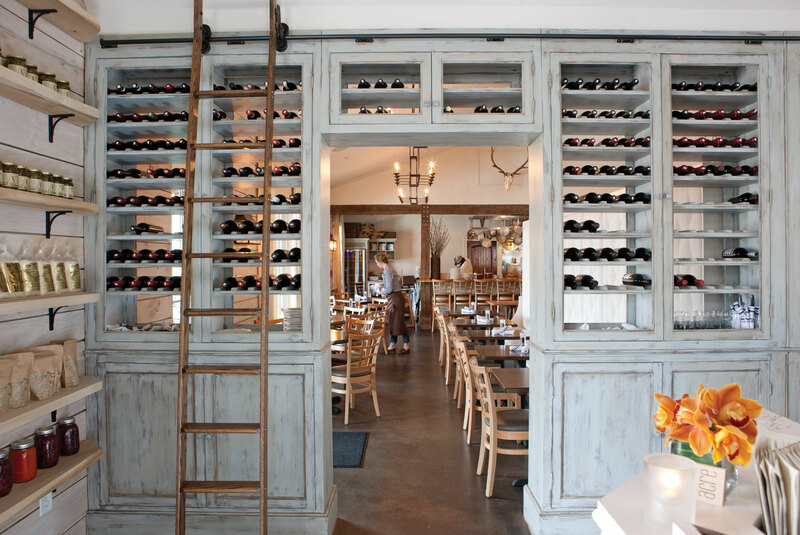 We are always drawn to farm to table restaurants. Even though neither my husband nor I were raised on a farm, we certainly experienced garden to table meals growing up and feel very fortunate and blessed to have been able to continue the same in our home. What a stunning restaurant!! I love the looks of it and will happily visit if and when I get to that area…..hope you are enjoying your summer Phyllis! What a wonderful tribute to the Acre restaurant. Last summer my husband took me to Restaurant Gwendolyn in San Antonio on the riverwalk to celebrate our 10th anniversary. It is also a farm to table restaurant. In addition it is slow food and all the preparations of the food were done with electricity as in the 1800s. It was a marvelous experience because fresh food, home cooked meals, and leisure time around the the table sharing with family and friends is a priceless treasure that should be celebrated more than special occasions! Love the farm to table restaurant experience. Nothing better! I am going to see my daughter who is a senior at Auburn (graduating in Dec.) on the 16th! Can’t wait to head over to this beloved spot! So glad you showed them some love! Warrrrr Eagle!!!!!!!!!!!!!! We had a similar experience at Acre! With a freshman headed to AU in the fall, we look forward to many more fabulous Acre meals. War Acre Eagle! I am a graduate of Auburn and my husband taught at AU back in the late 80’s, early 90’s. I wish that restaurant had been around then. War Eagles!! AC just ate there this week and LOVED IT!!!!! Sounds like a wonderful restaurant. The best seem to grow their own or buy local produce. Makes such a differance. sounds like an awesome addition to auburn. We will have to check it out. Thanks for the information, Phyllis.